The name Kilmallock is the anglised version of the Irish name Cill Mocheallóg-Church of St Moceallóg. 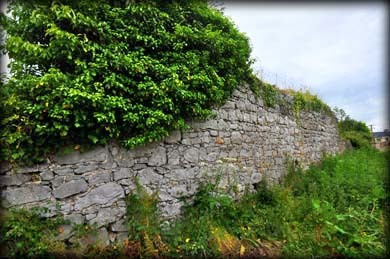 The existing town walls at Kilmallock are thought to belong to the late 14th/early 15th century. These walls replaced earlier town defences. There is evidence, on the west side of the town walls, of an early fosse (ditch) and earthen bank. This bank was probably topped with a wooden palisade. At present there are 1100 metres, of the original 1700 metres of stone wall, still surviving. The longest stretch, pictured above taken from SuperValu car-park, is on the west side of the town. There were originally five gateways into the town, of which only Blossom Gate, formerly known as Blae Gate(West), survives. The other gateways were known as St John's Gate (North), Water Gate (East), Ivy Gate (South) and the fifth gate known as Friary Gate led across the river to the Dominican Priory. All the other main monuments in the town such as King John's Castle, the Collegiate church and the 16th century Merchant's house are inside the town walls. There is an on going conservation and management plan to establish a green area around the town walls. Situated: Blossom Gate is located in the centre of the town on Emmet Street off the R 512/Main Street. 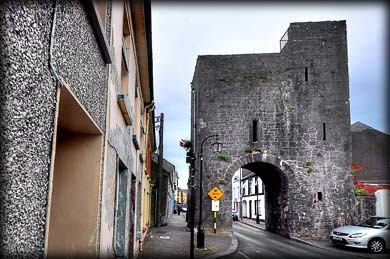 The town walls can be viewed from the SuperValu car-park. Discovery Map 73: R 6086 2764. Last visit June 2015.